Trans Saharan Airmail, Douala (Cameroon) to Marseille, bs 24/5/35 Gare Avion, via Cotonau (Dahomey) 17/5, Compagnie Francaise de l'Afrique Occidentale printed cover franked 1 F50 postage + 3F air surcharge, green blue/black airmail etiquette, ms ‘Via Cotonau’. Flown from Cotonau to Niamey by Compagnie Generale Transsahararienne, then by Air Afrique to Algiers, then Air France to Marseille. An interesting cover in fine condition and with good routing. 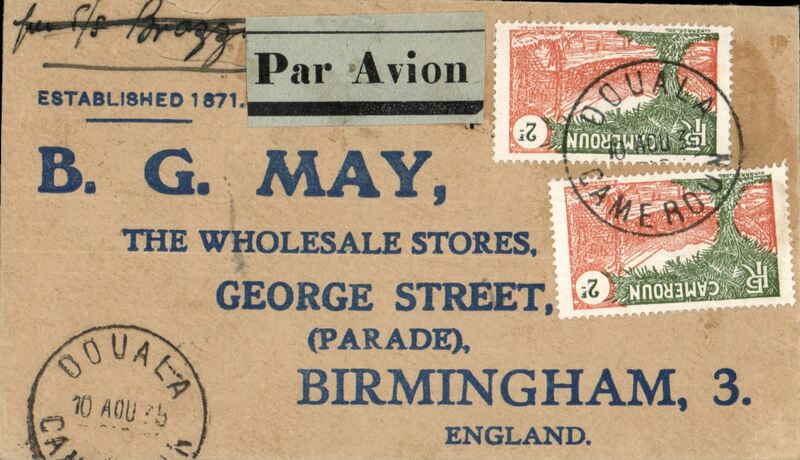 Douala to Birmingham, via Dakar 26/8, commercial printed cover correctly rated 1F50 postage and 3F airmail surcharge. Great routing. First Aeromaritime service via Takoradi, Douala to Dakar, b/s, two flight cachets, franked 2F50. Free French Africa in World War II, dual censored cover from Maiganga to Malvern UK, franked 2f 50 ordinary + 7f 25 airmail surcharge, via Lagos 25/9/41, sealed Free French and Nigeria censor tapes, the latter tied by nice strike of red hexagonal ‘Passed by Censor 11 Nigeria’ censor mark, also Free French 'Censor Yaounde' censor mark. Uncommon origin, Maiganga is 96 miles southeast of Fort Lamy and Yaounde is 600 miles from Lagos. Likely Sabena from Leopoldville to Lagos, then BOAC or sea to UK. Between August 1940 and the summer of 1943 , the heart of Free France was located, not in London, but in Chad, Cameroon, or Oubangui-Chari (modern-day Central African Republic). 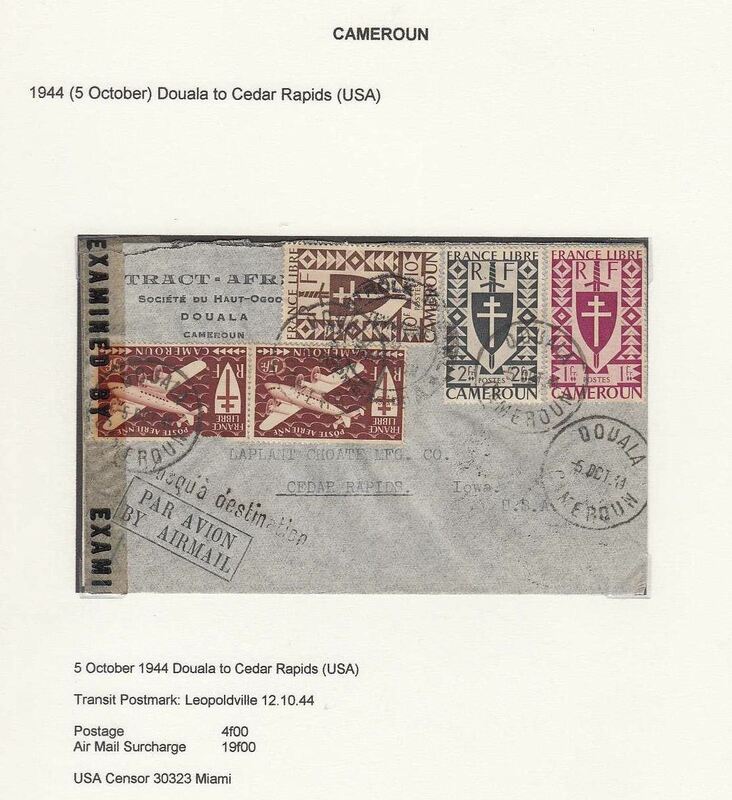 Free French Africa in World War II, dual censored registered (label) cover from Yaounde to Brazzaville (French Congo), bs 22/5/43, franked 1F postage + 12F air surcharge + 2F registration, canc Douala cds, sealed ‘Controle Postal Militaire’ censor tape tied by small ‘A1’ in circle Cameroon censor mark, also black circular ‘Territoire du Cameroun Controle’ hs. Between August 1940 and the summer of 1943 , the heart of Free France was located, not in London, but in Chad, Cameroon, or Oubangui-Chari (modern-day Central African Republic). 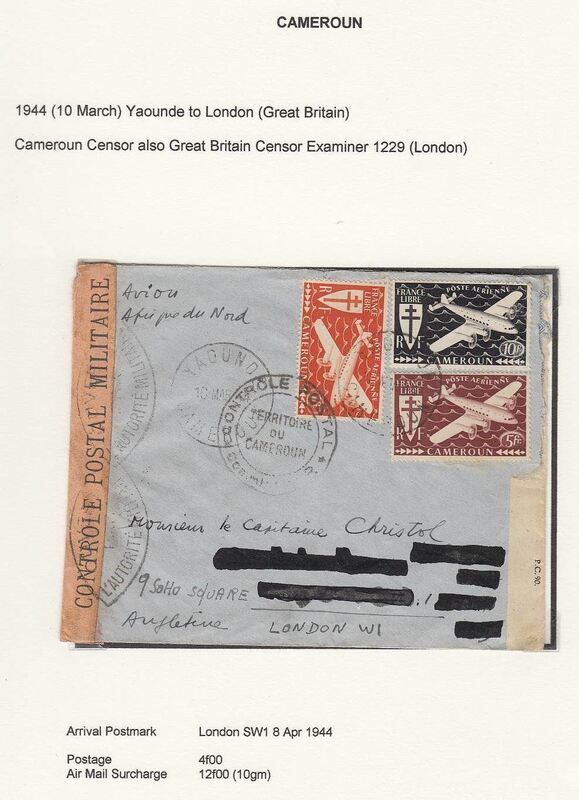 Free French Africa in World War II, dual censored cover from Yaounde to Edinburgh, franked 11f, sealed Cameroon censor tape tied by pointed oval ‘Ouvert Par L’Autorite Militaire’ censor Mark, also Nigeria violet triangle sensor Mark and black circular ‘Territoire du Cameroun Controle’ hs, ms ‘Via Lagos’. Likely flown BOAC or Sabena to Lagos, then BOAC West Coast route to England via at Lisbon. Between August 1940 and the summer of 1943 , the heart of Free France was located, not in London, but in Chad, Cameroon, or Oubangui-Chari (modern-day Central African Republic). Free French Africa in World War II, dual censored cover from Yaounde to London, bs 8/4/44, franked 4f ordinary + 12f airmail surcharge, sealed Cameroon ‘Controle Postal Militaire censor tape tied by pointed oval ‘Ouvert Par L’Autorite Militaire’ censor Mark, also sealed GB sensor Examiner 1299 (London) censor tape, also black ‘Controle/Territoire du Cameroun’ censor mark. Yaounde is 600 miles from Lagos, likely by Sabena from Leopoldville to Lagos, then BOAC or sea to UK. Between August 1940 and the summer of 1943 , the heart of Free France was located, not in London, but in Chad, Cameroon, or Oubangui-Chari (modern-day Central African Republic). Free French Africa in World War II, censored Pan American Transatlantic airmail, Douala to Cedar Rapids, USA, via Leopoldville 12/10, franked 4f ordinary + 19f airmail surcharge, sealed Miami 30323 censor tape, nice strike straight line ‘Jusqua Destination’ hs and framed printed Par Avion’ cachet. Between August 1940 and the summer of 1943 , the heart of Free France was located, not in London, but in Chad, Cameroon, or Oubangui-Chari (modern-day Central African Republic). 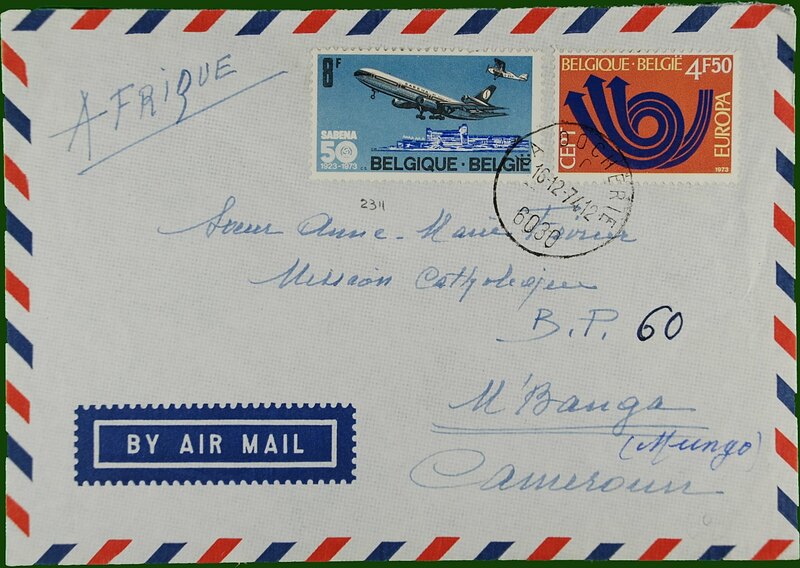 Commercial air cover to Mbanga, b/s, from La Dochiere, Belgium, franked 12.50F. Uncommon destination.